2016 is certainly a star vintage with bright intense wines of great flavour intensity and inherent balance. 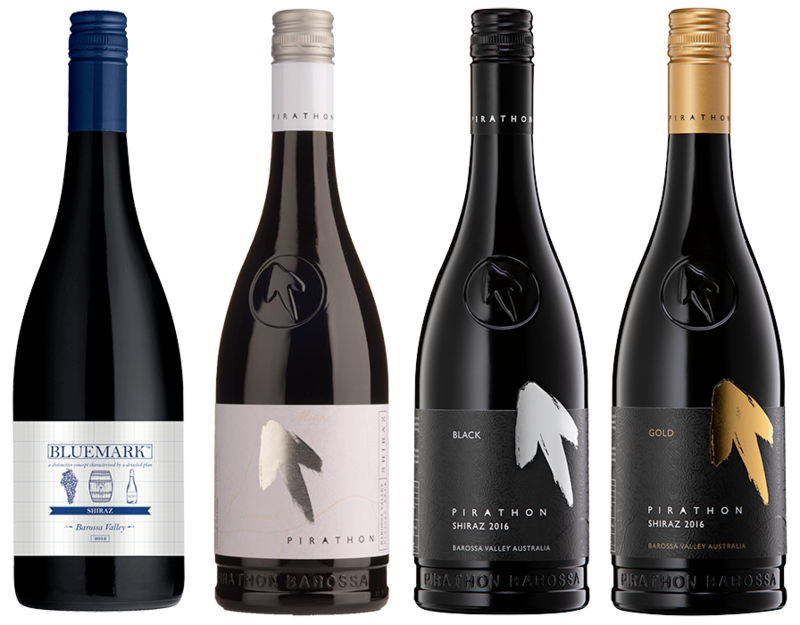 In this vintage Pirathon offers a range of four outstanding Barossa Valley Shiraz. This bold Barossa Shiraz has an inviting bouquet with aromas of ripe plum, Christmas cake, fruit compote and chocolate oak. The full-bodied palate is rich and intense with an abundance of flavour and a deep colour. Pirathon Silver is the classic and award winning Pirathon Shiraz. Full bodied displaying bright fruit characters contribute to this plush wine. This is an extremely balanced Shiraz with fruit, oak and tannin working together. New to the range in 2016, Pirathon Black is the first of Pirathon's reserve bottlings. It is a rich and full bodied wine with an uplifting and alluring aroma. Plush juicy dark fruits dominate in this well balanced, mouth filling Barossa Shiraz. New to the range in 2016, the Pirathon Gold reserve bottling delivers a classy Barossa Shiraz. It is rich with powerful flavours and intense aromatics. A palate of bright fruits balanced with chalky tannins dominate in this premium Shiraz. New to the Pirathon product range 2016 is Pirathon Total, which offers the complete Pirathon experience in one easy order. Vintage 2016 was hot and dry resulting in grapes ripening earlier than average. Winter and Spring rainfall was down by 38% whilst growing season temperatures were up by 3 degrees. Some welcome rain came at the end of January refreshing the vines and giving them good moisture to ripen to maturity. Yields from 2016 are solid and importantly quality is stunning. 2016 is certainly a star vintage with bright intense wines of great flavour intensity and inherent balance. The grapes were harvested from the low-yielding vineyards of traditional family growers in the north-western Barossa districts of Greenock, Moppa, Belvedere, Stonewell, Seppeltsfield, Koonunga and Ebenezer. Each vineyard adds its own exclusive dimension to Pirathon Shiraz and combined they produce the ultimate blend. Each vineyard was harvested at optimum maturity across a two month period from February 12th to April 6th. Following harvest, each individual lot of grapes was crushed into a separate open top fermenter. During fermentation, hand pump-overs gently extracted colour and flavour from the grapes. After 7-10 days on skins the fermented grapes were pressed with a traditional press. The wines were then filled for maturation for 18 months before each lot of wine was carefully blended. The wine was bottled without fining, ensuring the true expression of the vineyards in the bottle.